Have you ever seen a magazine cover that you loved so much you wanted to just step inside and see more. Isn’t it frustrating when an article leaves you wanting more.more photos, more information, more details. Well today is your day. I have some details . I recently visited this home in Birmingham. Days after it came out on stands as Southern Living’s March cover. See the online article here. Here is the before and after. It was so cute before but the lighter colors and new details are amazing! The ironic thing is I bought the issue at the grocery the day before my trip to Birmingham(because I couldn’t wait for it to arrive in the post, I am impatient that way when I see a cover I love) then my client told me via email “oh BTW the house is on the cover of SL this month, I will tell you all about when you arrive” WHAAAAAAT??????? I was so excited of course. Ragan, the homeowner is my e-client, we have been working nearly a year on a small space in her upstairs. (I will tell you more about that project in a later post) Finally after a lot of back and forth about samples she said “just come to Birmingham” so I went last weekend, just days after cover came out. Now let me make clear, I had nothing to do with the changes to the Ragan and Brad’s exterior. Their Mountain Brook home was already precious as you can see but they worked with architects Paul Bates and Jeremy Corkern to lighten it and add more detail, including the cedar shake roof and COPPER GUTTERS. I didn’t know I could love a gutter so much. 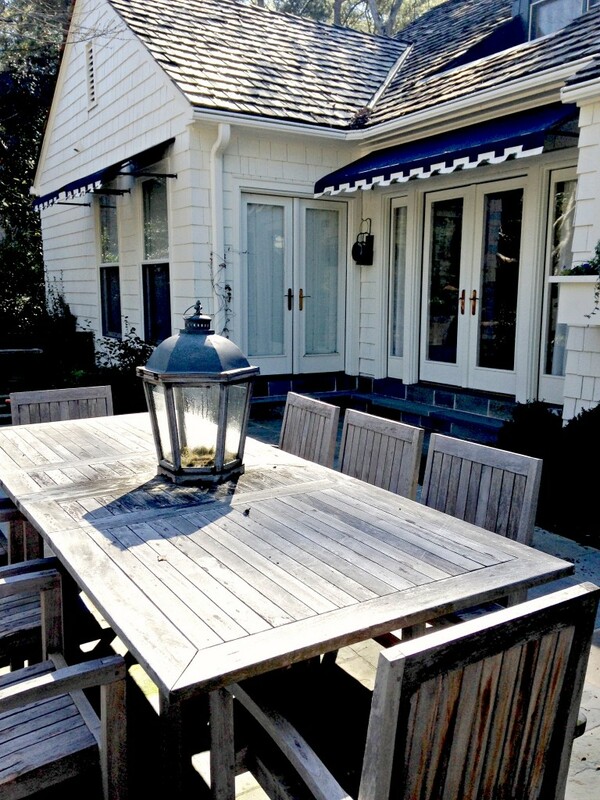 The outside is utter perfection…..PERFECTION, wait until I show you the back with AWNINGS. I love an awning. And her sweet dogs Gypsy and Judge! Not to mention the lanterns at the front. Seriously, huge, copper, GAS lanterns like none I have ever seen. And I notice lanterns. 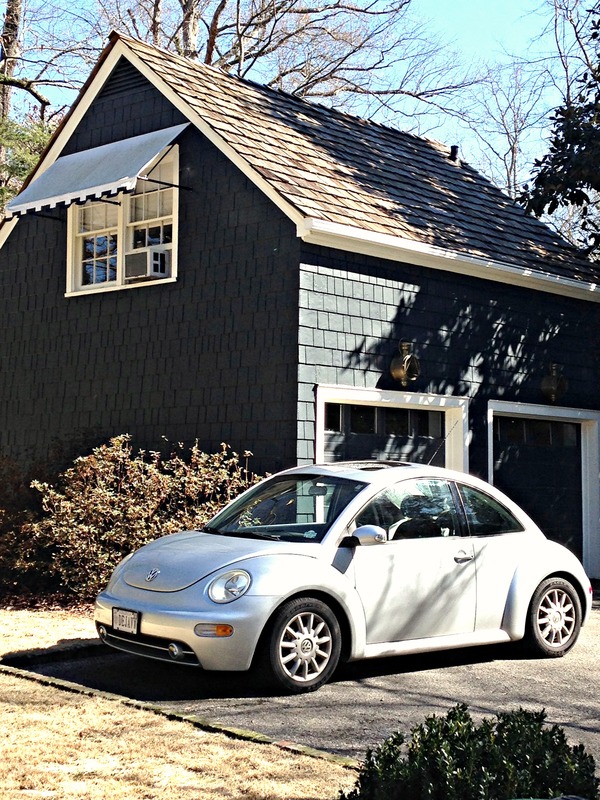 Check out the darling garage with apartment out back. It has some amazing nautical lights on it that I couldn’t get pics of with my phone but they are so good. I like that they left the garage the darker color. 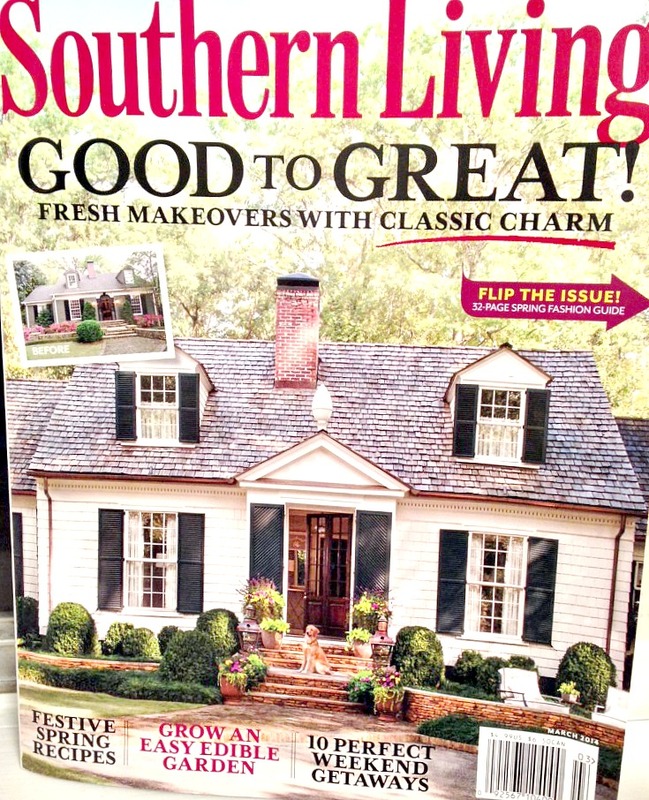 You can find more info on sources and the project in the current issue of Southern Living. You can see the online article here. The house is painted BM White Choc and the shutters are Farow & Ball Railings. My fave besides the gutters and awnings and lanterns and windbox are the cedar shake shingles on the roof. Ragan and I bonded on our love for those. So charming. The article discusses the pineapple as well…that is a new addition by the architect! More on my trip to Birmingham in another post, first I want to take you inside Ragan and Brad’s home and show you more and then I want to post more on Birmingham..y’all the shopping there is GOOD! I really loved the city. And the people talk like me and are so friendly. i love birmingham, maybe because that’s where my son, DIL and 2 of our grandchildren live. wonderful town and you’re so right, a lot of shopping places! did you go over on hwy. 31 to some of the flea markets/antique stores? i saw this magazine cover while i was at the dentists office last week and meant to pick it up later during the week but completely forgot…much get mine soon! i can’t wait for you to share the inside. Oh I want moooooore! Love that exterior, but I want to see the interior. Can’t wait!! Oh yes, the shopping is wonderful there in Birmingham. (Keep coming further east and you can take me shopping. LOL) The awnings and the copper gutters ARE gorgeous. I think their shutters are fabulous too! And they have a VW bug. Oh my!!!! Hey Kelly that isn’t their VW bug but it is cute sitting there! My absolute favorite SL feature house in a long time!!! Hurry on your next post ! Can’t wait to see more of this house!! It’s dreamy! Love it. Makes me want to buy an older home with character and charm. I jumped at that cover! Holly–your blog leaves me happy, and itching for more . . . Keep the beautiful work coming–no better mix than livable style! Everything about this house is perfection. Did any details get overlooked? I think not. I love, love, love the gutters and the roof. I think the roof is so awesome! My parents were going to get that kind for their home, but the insurance company wouldn’t cover if something were to go wrong. And the exterior color is perfect. My dream home that I emailed you about has an exterior of shakes and seeing this in it’s glory makes me want it even more. I can’t wait to see inside!!!! Oh, and that garage! I’m loving it too! I need that for my mom so she can stay over. That exterior is just incredible. 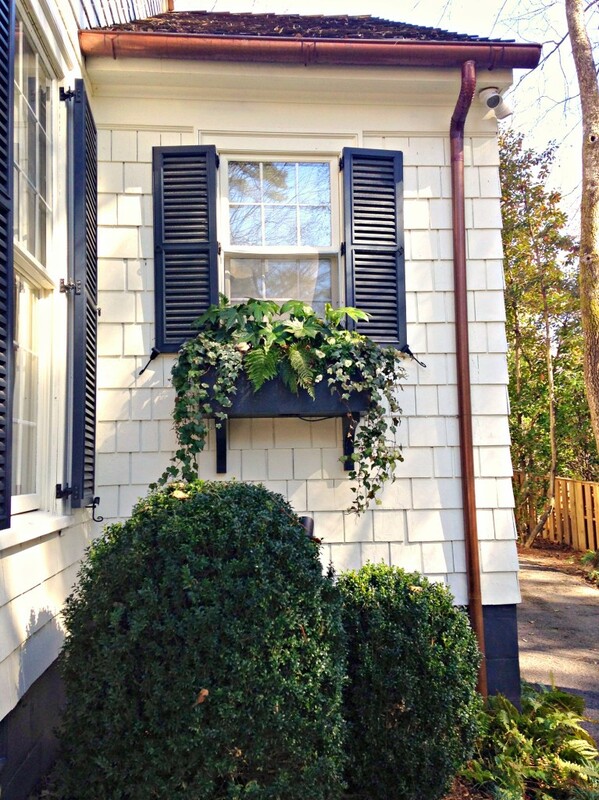 I love the copper gutters, the awnings and the shrubs in front make it feel a bit modern. So beautiful! I live in Mt Brook too! This house has always been one of my favorite houses in Mt. Brook. I run by often just to peek! When they started re-doing it I was so worried that they were going make a huge addition and completely take over the lot like so many houses in the area have done. I am amazed that I love this house even more now. It is absolute perfection! I have been reading your blog for a while so it is fun to know you were here! I cannot wait to see what you have done! I am on pins and needles…can’t WAIT the Holly Magic!!!!!!!!!!! SOOOOOO charming!!!! Love it!!! And love that you’re able to share the inside scoop on the magazine cover and all the details about the exterior. 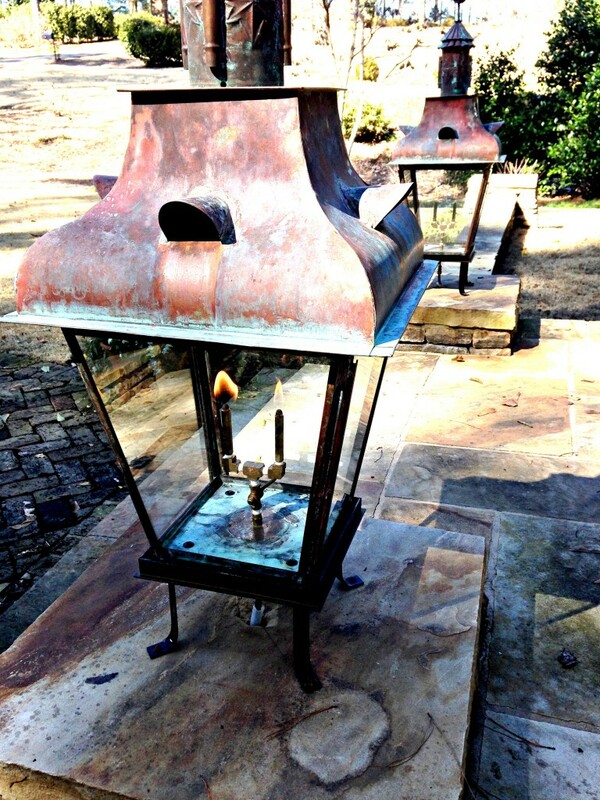 The copper gutters are wonderful but love, love, LOVE the copper gas lanterns. Ohhhhhh!!!!!! to die for. 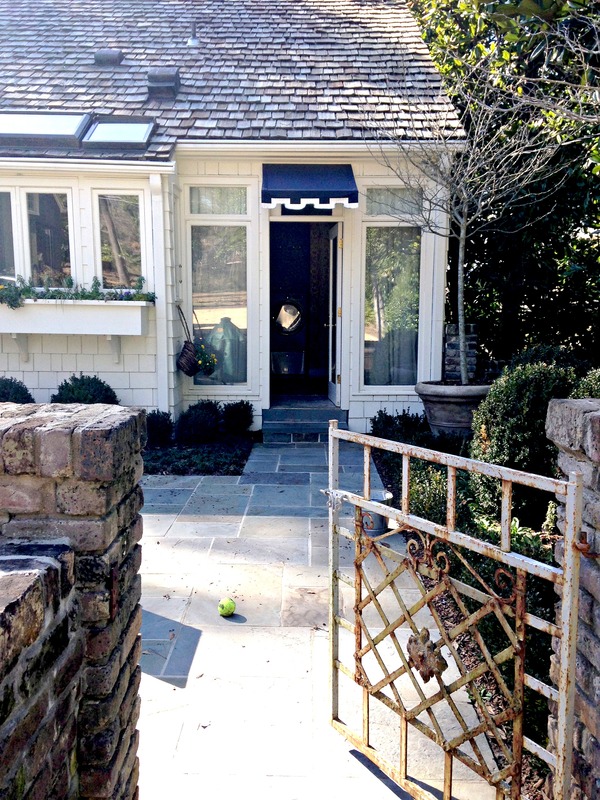 I love everything about this charming home!!!! Where can I purchase that Pineapple over the door!!! I love it! !